We create templates of engaging reading programs, because our clients are plenty busy and there's always more to read. Our team of educators and reading specialists regularly creates template reading programs that clients can copy and customize as they choose. 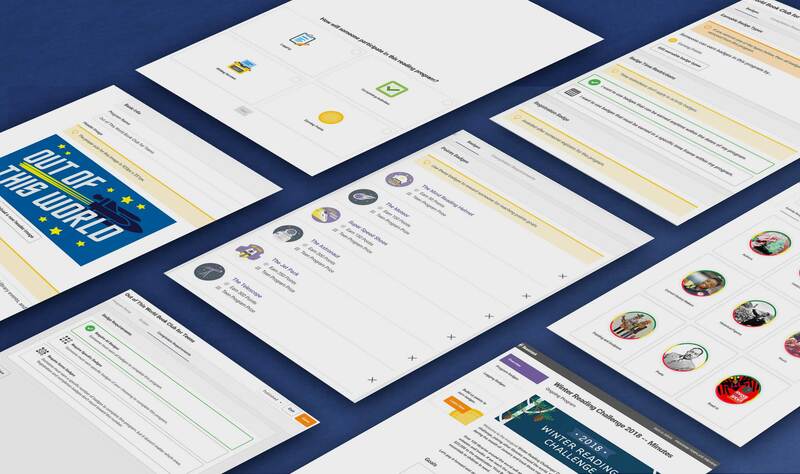 These templates include new, handcrafted virtual badges and marketing materials. 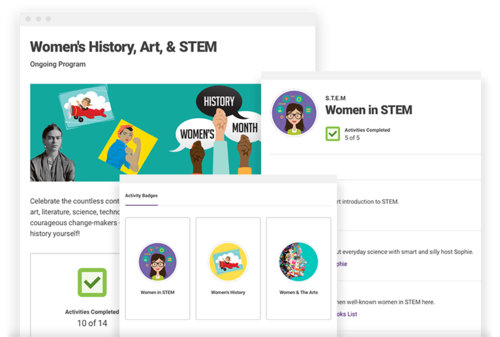 And they range in the theme and design from logging minutes after New Year's to completing activities and earning points just in time for Thanksgiving. 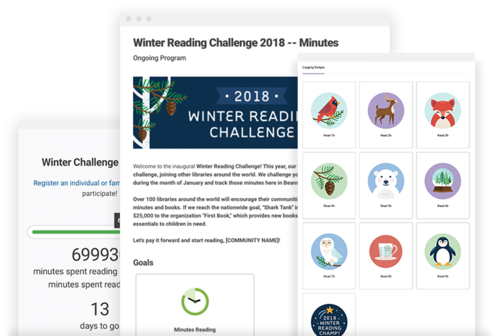 This reading program, for which we provide both "minutes" and "books" templates, is part of our annual Winter Reading Challenge, sponsored by our investor Mark Cuban. Our team provides clients with "forest animal" virtual badges designed to represent winter without using snow. We also provide marketing materials, press releases, and help spread the word on social media with #WinterRead2018. In 2018, close to 100 of our libraries are collaborating to read over 1.5M minutes and 50,000 books during the month of January toward Mark making a donation to the non-profit organization First Book. 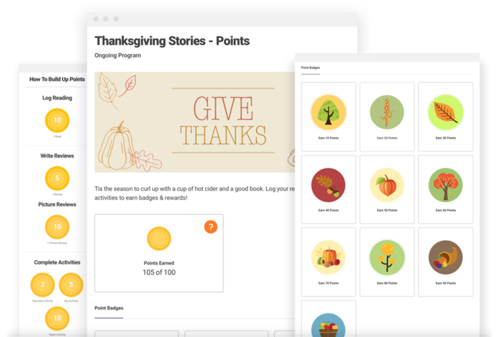 For Thanksgiving 2017, we created a points-based reading program template whereby readers can earn badges by combining logging minutes, books, pages, or days with completing activities and writing reviews. Of course, we incorporated badges that represent the Thanksgiving holiday and had fun with the autumn colors. Interestingly, our data shows that when provided the choice to log minutes or books for this reading program, readers more frequently chose to log minutes. This template is designed as an activity-based program for the week of Valentine’s Day. Readers are provided with sources to celebrate love in all forms, whether by reading heart-warming books, discovering poetry, crafting, or creating heart-healthy treats. 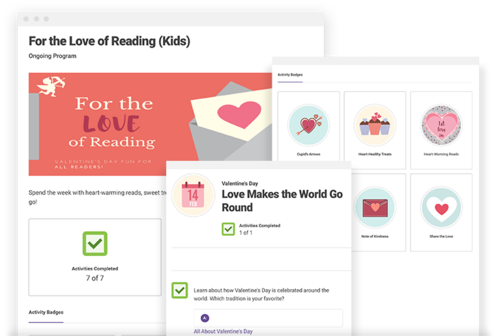 Valentine-themed badges can be earned for activities like “Learn about how Valentine's Day is celebrated around the world. Which tradition is your favorite?” and "Read a sonnet by Shakespeare and write your own poem using the same form.” Readers are also encouraged to “share the love” through acts of kindness for family, friends, and their community. 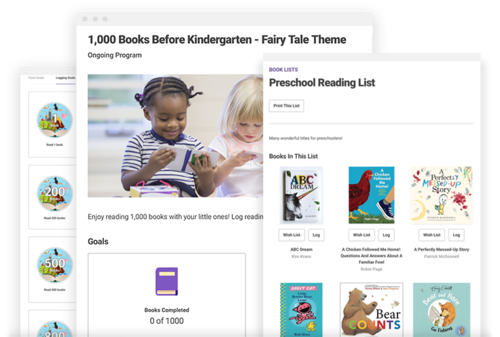 "1,000 Books Before Kindergarten" -- or similar programs like "500 by 5" and "Ready, Set, Kindergarten" -- is among the most popular reading programs for public libraries on the Beanstack platform. We therefore have two different templates, one that is space-themed and another that is fairy-tale themed. Each has 12 badges in all. Additionally, clients can duplicate recommended reading lists for ages birth to five or create reading lists from scratch. Each reading list is matched to the age of the reader so that children, teens, and adults see the books most recommended for their age and grade-level. 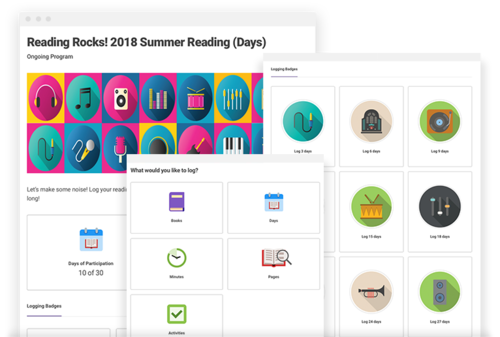 This reading program is designed to be entirely activity based with our reading specialists keeping in mind that each library and school has a different collection and calendar of events. We used badges that represent "Cuisine," "Poets," "Historical Figures," and other categories. 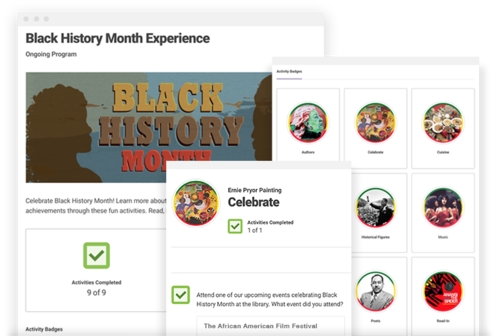 Each badge is linked to the completion of an activity or text-box activity like "Read a book about an African-American making history today or in recent years. Who is the person, and what is one thing you learned about them?" Templates for logging by days, minutes, books, and points are all available to save library admins time in setting up their 2018 summer reading programs. These templates follow the Collaborative Summer Library Program's "Libraries Rock" theme and iRead's "Reading Takes You Everywhere" theme. They use badges and virtual banners created by the Beanstack team. Libraries that are partners with CSLP and iRead may use art designed by these organizations. The above screenshots show a template using logging by days, which is the fastest growing log type for our clients. 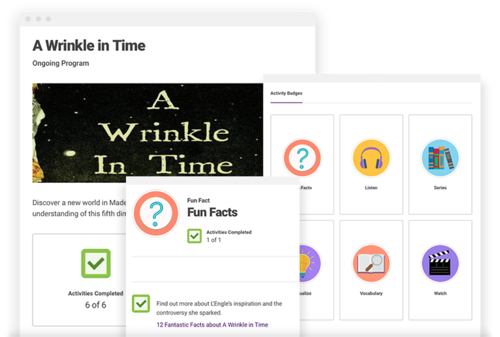 Discover a new world in Madeline L’Engle’s famous book and explore space & time with our activity-based program template! Activities such as “Check out the perspective projection of a tesseract" challenge the imagination, and tools are provided to help with new vocabulary along the way. Readers are encouraged to grab copy of “A Wrinkle in Time” from their local library and dive in. With a series of activities, readers discover the countless contributions women have made throughout history to art, literature, science, technology and more. Activities include learning about historical figures, women’s suffrage, famous artists, and the future of women in STEM fields. Studying these vibrant, courageous change-makers may even encourage readers to discover ways THEY can make history! Celebrate diversity and reading year-round with “Read Across America.” Our team of educators believe in the importance of understanding and appreciating our own unique stories. This template provides families with tools that promote diverse literature and learning experiences. 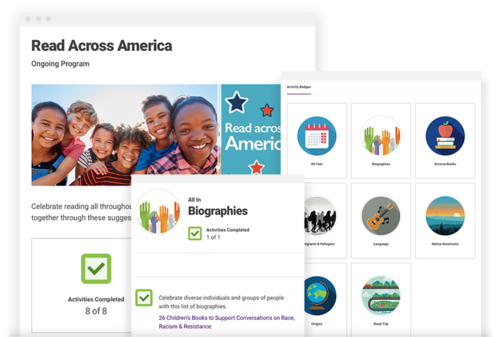 Through a series of activities, readers are encouraged to study their family origins, explore different cultures, and discover the ways we can grow together. Participate in The Great American Read, an 8 part series created by PBS. This challenge was created to recognize and cherish the literature that has impacted us and continues to inspire new generations of readers. You can track your reading, complete activities, and help vote for America’s Favorite Book! Immerse yourself in the lyrical and wonderful world of poetry! 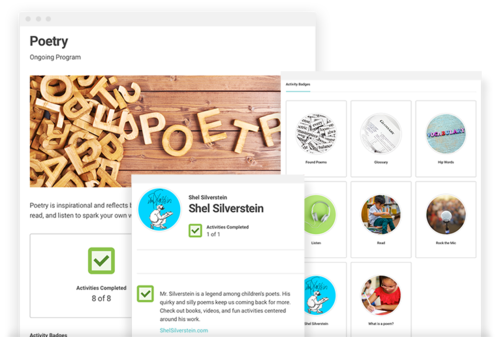 Share different kinds of poetry and the laughter, tears, and questions poems elicit using the activities and resources in our poetry template. Get inspired through videos, recordings, and writing ideas to find your own inner poet!